NOTE: Only 80 seats will be available for each performance, so if you are interested in attending, please purchase tickets early! A group of UNC Asheville students will be bound for Scotland this summer to perform at what is billed as “the world’s greatest platform for creative freedom.” With some 3,500 shows of every stripe and 2.8 million tickets sold, Edinburgh’s Festival Fringe is the biggest arts festival on the globe. And UNC Asheville’s students, having been granted a chance to perform there, are ready to show Nothing to the world. Nothing’s Happening – A Black Mountain College Project will first preview on campus at Belk Theatre, April 18-20. 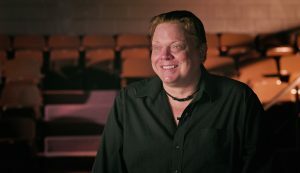 This original work of theater is being created almost from scratch by students working with Leon Ingulsrud, co-artistic director of New York City’s SITI Company. Ingulsrud, who is on campus as UNC Asheville’s spring 2019 Black Mountain College (BMC) Legacy Fellow, chose the famed 1949 Lecture on Nothing by BMC luminary John Cage as a backbone for the new work. The Lecture on Nothing is becoming infused into the spines and souls of the troupe of student actors in four-hour-long daily work sessions while Ingulsrud is on campus. Is it music? Is it theater? Is it a philosophical treatise? “Even though it’s a lecture about nothing, it’s also about everything,” says drama student Caroline Kelly. Cage’s lecture was “scored” by the author/composer not with pitches, but with an odd and precise time scheme. It comes to life with an energy that grows as the students, working in small groups, come up with gestures and changes of tone and volume to add meaning and drama as they discover it, or bring it to the mysterious text. As the work continues, some of these gestures may grow into character sketches, short scenes, songs, or, who knows? Ironically, Cage, known for incorporating random operations into his art, is being used by Ingulsrud to add structure for the students. “It’s difficult and not always productive to start with a completely blank slate,” he said. “So I’ve brought in John Cage’s Lecture on Nothing as a backbone. The Lecture on Nothing for me brings enough poetry, enough beauty, enough to think about, to sustain. But I want that to be a spine on which we hang other things that intersect with it, interrupt it, coexist with it, while at the same time, performing the Lecture on Nothing at a level that will be satisfying. “I do expect it to be a lot of fun to experience – interesting, deep, and fun – there doesn’t have to be a contradiction. Bugs Bunny is a great teacher of that, and Herman Melville,” said Ingulsrud. By the time the lights dim (or will something else happen with lighting or sound?) 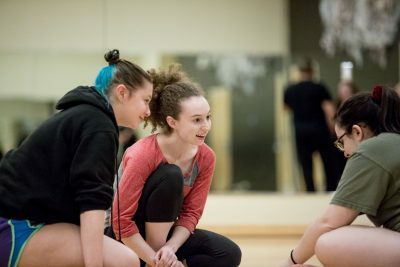 in Belk Theatre at 7:30 p.m. on April 18, the student troupe will have had a two-week and a four-week stint with Ingulsrud, working four-hours a night, five nights a week to develop and hone Nothing’s Happening. And as exciting as the April shows promise to be, they will serve as the equivalent of an off-Broadway run before a show hits the big time. To learn more, see this feature article from The Blue Banner. Artist Mel Chin was the fall 2017 BMC Legacy Fellow, and together with UNC Asheville’s STEAM Studio students, faculty and staff, he created Wake, an animatronic sculpture that was exhibited in New York City’s Times Square last summer. In spring 2018, experimental philosopher and conceptual artist Jonathon Keats was the BMC Legacy fellow, and he worked with students to create what he called a “universal orchestra” with sounds aimed at the cosmos. The renowned string quartet Brooklyn Rider held the fall 2018 BMC Legacy Fellowship; the group offered performances and workshops on and off campus.